Articles in this category cover how geology exerts influence on a range of land use and environmental issues. They include, seismicity, ground stability including landslides, flooding, radon and mining legacy. 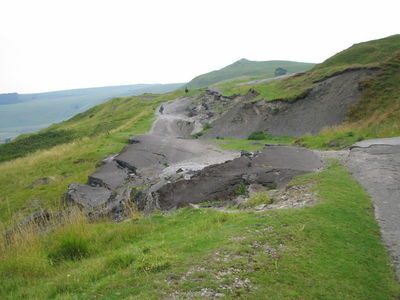 The Mam Tor landslide: the Turn Pike Road damaged by the landslide. This page was last modified on 23 July 2015, at 08:03.